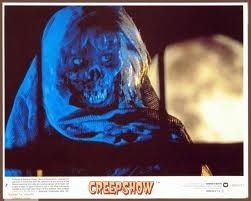 Let me start off by saying that “Creepshow” is my favourite horror movie. It’s the best horror anthology (and believe me, I’ve seen a ton of them) and strikes a perfect blend of horror and comedy, no easy feat in movies, old or new. 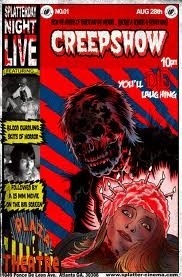 An homage to the equally great 50’s EC comics (that would spawn two great horror anthologies and an excellent TV series) “Creepshow” is a labour of love from two horror masters. As previously stated, this is an anthology of 5 stories and a wraparound tale (starring Stephen King’s son and genre vet Tom Atkins) all written for the screen by master storyteller Stephen King. The stories come from a (non existent) comic book that Atkins throws out at the beginning of the film. There’s a corpse that comes back to life to exact revenge on Father’s Day, a meteorite that spreads plant life at an extreme rate, an ancient crated beast that helps a man kill his wife, a revenge plot that leads to watery zombies exacting their own revenge and a hated millionaire being attacked by cockroaches. In short, lots of laughs and gross Tom Savini effects ! 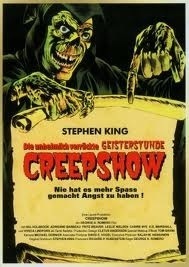 Much like “The Sentinel”, “Creepshow” has an excellent cast anchoring it. Ed Harris (dancing hilariously), Leslie Nielsen, Adrienne Barbeau, Stephen King, Hal Holbrook, Tom Atkins, Ted Danson and Tom Savini. Everyone seems to be having a great time, and the passion for the project really comes through. In particular it’s fun seeing Nielsen as the villain for once. I was lucky enough to see this in 35mm on the big screen for the first time at our local Mayfair theatre. They’d had the print for two years but never screened it because of a missing real (classic grindhouse !). After an online poll asking if there would be interest in showing the blu ray for the missing 20 minutes, it was decided they would proceed with the screening. The crowd was loving it, and I was sure to wear my Creepshow hoodie there to celebrate. The movie is made to feel like watching a comic book on screen, ideal, since it was an homage to comic books in the first place. A recent attempt at this was Ang Lee’s “Hulk” film, which used a similar tactic of framing the screen with comic book panels. I wasn’t a huge fan of that film, but I really appreciated its visual style in that regard. 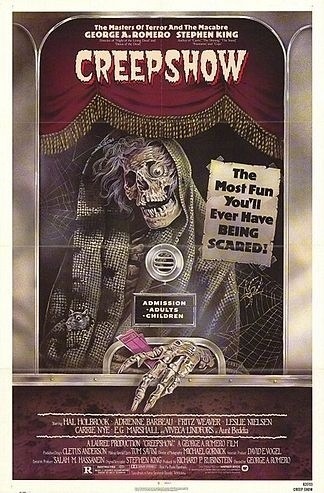 “Creepshow” is an undisputed cult classic, leading to two sequels and a web series. Only the second film is really worth checking out, though I have far less vitriol to spread over the third film. It attempted a sort of “Pulp Fiction”-esque style of connecting all of its stories. An interesting idea, but the production values were extremely low, making it look nothing like the first two films. The films greatest strength is its triple threat of horror masters in the directing, writing and special effects departments. It was clearly a labour of love for George Romero (Dawn of the Dead), Stephen King (The Shining) and Tom Savini (Friday the 13th), not to mention the cast themselves. It’s pretty rare to have such an assemblage of talent on a genre project, leading to a sort of lightning in a bottle gem of a film. Another excellent aspect of the film is the original score by John Harrison. It was eventually used in “Grindhouse” for Eli Roth’s fake trailer “Thanksgiving”. While I’m no fan of Roth, he does have good taste in horror films. Hearing the familiar strains from “Something to Tide You Over” immediately conjured up thoughts of the murderous Leslie Nielsen cavalierly driving back to his home after exacting his revenge. 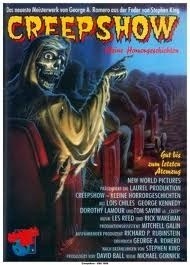 “Creepshow 2” continued the tone of the first film, even having a screenplay written by Romero, adapted from 3 more Stephen King stories (and featuring King in a cameo appearance). While Romero didn’t direct, the cinematographer from the first film did, certainly helping maintain a similar tone. Certainly not as good as the original, it remains a pleasing anthology film in its own right. 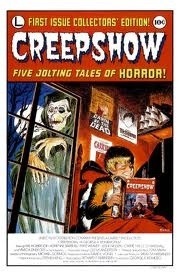 While an homage to the “Tales from the Crypt” comics of the 1950’s which would go on to spawn an acclaimed TV series themselves, “Creepshow” was also intended to have its own TV series. It eventually became the Romero created “Tales from the Darkside”, which itself lead to a movie version. 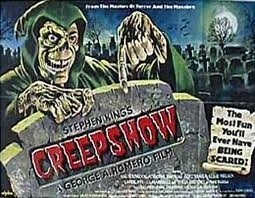 That film ended up being directed by Creepshow composer John Harrison, with one of its stories being another King adaptation by George Romero. 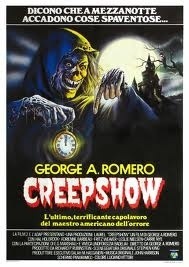 This has lead to Tom Savini referring to it as “The real Creepshow 3”. If you’ve never checked out this film, I (clearly) highly recommend it. It’s a real blast, an excellent blend of comedy, horror and the pulp comics that inspired it in the first place. Anthology films, especially horror, are extremely difficult to pull off, many suffering from subpar stories. While some dismiss the comedic King-starring second segment, I find it breaks up the film nicely and keeps its tongue firmly in cheek. If you’re looking for a fun, colourful 80’s horror story romp, or are a fan of “Tales from the Crypt”, look no further than this enjoyable gem. This entry was posted in Reviews and tagged 2012, amazing, anthology, best, bugs, cartoon, classic, crate, crypt, cult, danson, gore, gross, guts, Halloween, Harris, Horror, king, October, Romero by lazron. Bookmark the permalink.